Older homes are rich in character and history, making them a popular choice for homeowners. While it’s possible to maintain most of your older home’s charm, inferior plumbing is less likely to stand the test of time. 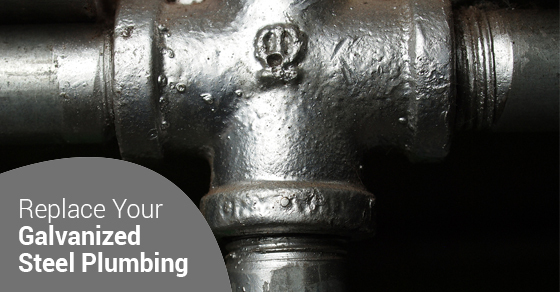 If you’re home was made before the 1960s, you might be using galvanized steel plumbing. Over time, we’ve learned the risks posed by galvanized steel to both the health and comfort of residents. If you think you’re home water supply is running through galvanized steel, contact an experienced plumber to learn more about how you can upgrade to the modern, durable materials available today. Galvanized plumbing are steel pipes that have been covered in a layer of zinc. These pipes are more susceptible to corrosion and, over time, the buildup of rust leads to the release of the toxin Lead. Aside from a host of health issues, this build up of rust within the walls of the pipes can cause low water pressure or discolouration in your water supply as a result of iron deposits. Do you have galvanized steel plumbing? There are several tests you can run in your home to find out if you have galvanized steel plumbing. First, turn on your hot water from the tap or shower head. If the water pressure is significantly low, or if it looks red or dirty, this is a good sign your home has galvanized steel. Another test is to scratch the surface of your pipes. If they are silver-grey, they are galvanized steel. This test will require you to access your piping. If you think you won’t be able to easily do this, contact an experienced plumber to perform an inspection. Aside from decreased water pressure, lead buildup will result as galvanized steel corrodes. The risks of lead build up are well-documented. Long-term exposure, especially in children and pregnant women, can cause serious health problems from developmental delays, premature birth, cardiovascular effects and more. While it might seem like a significant undertaking, upgrading your plumbing system is a necessary step to protect the health of those using your water supply, and enjoy better water pressure and quality. You can maintain the characteristics of your older home while also benefitting from modern features. Speaking with an experienced plumber about removing outdated galvanized steel plumbing and replacing it with modern PVC and copper piping will ensure you have strong water volume and pressure and are safe from lead exposure.